Okay - On this rainy day I went down to the work area to continue cleaning out. 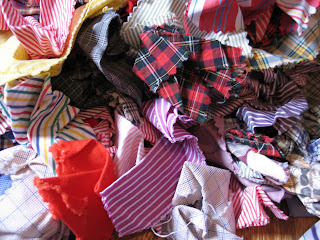 Several years ago I bought these beautiful shirting samples...Italian cotton. 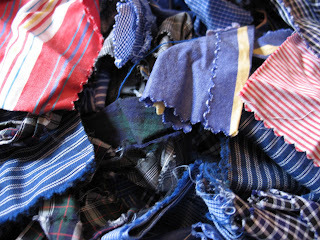 I received them and washed them and even sorted them into brights and blues and plaids. They're wonderful to the touch. I used a few of them to make some trim on a Mrs. Liberty doll. Sigh. They're beautiful. Sigh again - they need to be in the hands of a genuine quilter. Here's the pile of them unironed. 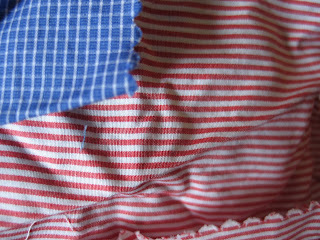 It would take a lifetime to assemble so many wonderful shirting materials that are different. There are probably 200 samples in this pile. They look like rags but they're not. They're the stuff that heirlooms are made of...waiting for a new owner, for someone who will love them and really use them.